HARDER. BETTER. FASTER. 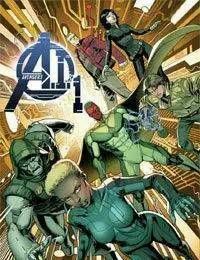 STRANGER.<br />The triumph of Hank Pym turns to tragedy for the human race...an unfathomable Pandoras Box of destruction!<br />When a brave new world is unleashed, only one team of Earths Mightiest Heroes can save us from the future - AVENGERS A.I. !<br />THE VISION! HANK PYM! VICTOR MANCHA! DOOMBOT! The mysterious ALEXIS! MONICA CHANG, AGENT OF S.H.I.E.L.D. !<br />The AGE OF ULTRON is over! The AGE OF A.I. is NOW!